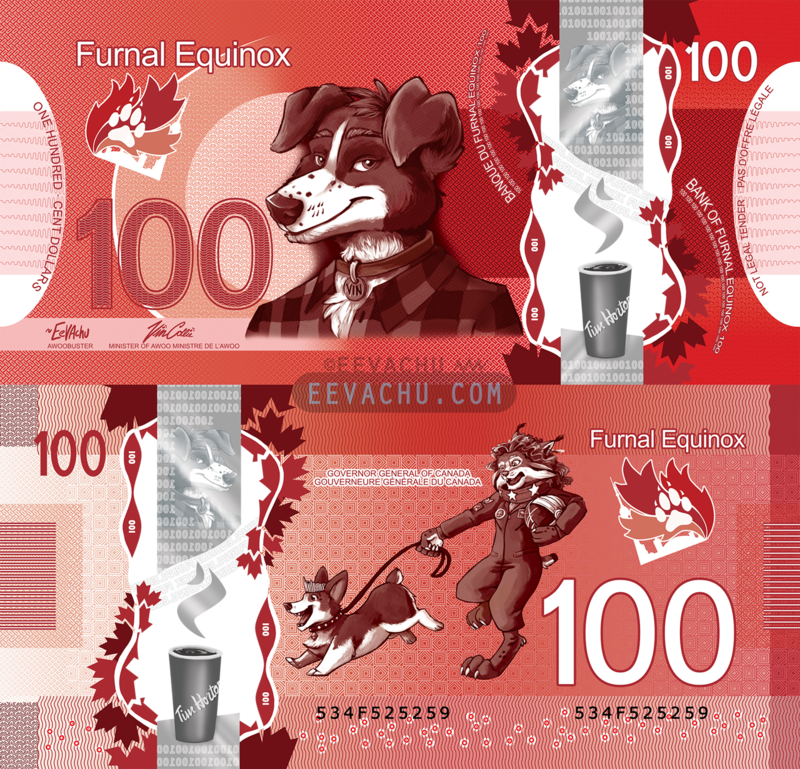 I was approached by Olefin to design a fake $100 bill to fit Furnal Equinox’s 2018 theme of “Living Large.” Concepts were mostly Olefin’s, I just added a bit of personal flare to them. Thousands of bills were printed and sold for charity and made to rain on congoers. They were an absolute hit! A stack of them live in my display case and one is laminated on my desk, I love how they turned out so much. Vin Collie aka Sir Robert “Vin” Borden-Collie, 8th Prime Minister of Canada, in plaid. My signature as the nation’s official “Awoobuster” and Vin Collie’s signature as the “Minister of Awoo”/”Ministre de l’Awoo” (Vin dots their i’s with paw prints). “Holographic” security strip with a steaming cup of Tim Hortons coffee and a holo Vin. Bank of Furnal Equinox/Banque du Furnal Equinox instead of Bank of Canada. Left and right semicircles featuring: ONE HUNDRED – CENT DOLLARS and NOT LEGAL TENDER – PAS D’OFFRE LÉGALE. Furnal Equinox logo instead of the transparent Maple Leaf window. The Governor General of Canada, Her Excellency the Right Honourable Julie Payette, as an anthro version of the astronaut lynx featured in her personal coat of arms taking Her Majesty Queen Elizabeth II as a corgi (in a tiara with an ID tag that says Liz) for a walk. Sort of a metaphor for the job of governor general. Bill serial number is 534F525259 aka hex for SORRY. 2018. Adobe Photoshop CS6; Wacom Cintiq 22HD; Each original side is 7110 x 3420 px.